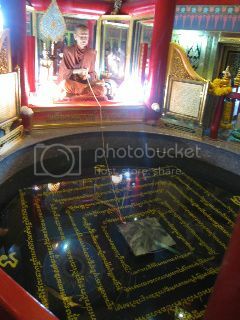 Wat Indraviharn or Wat Inn as its commonly referred to was formerly known as Wat BangKunProm. This temple has an aura surrounding it that's unmistakably serene. Wat Indraviharn is an old mystrical monastery build in the late Ayutthaya period circa 1752. This temple is renown for its Somdej pronounced "Somdet" type of amulet. LP (Luang Phor : Venerable) Toh is synonymous with the Somdej amulet and this temple. Somdej amulets coming out of Wat Rakhang, Wat Indraviharn and Wat KateChaiyo are sought after by collectors for their intrinsic power. The process in which these amulets were created is were unique and powerful. Somdej Toh used special yant inscriptions on the powder, spells and his meditative power to create his powerful amulets. Hence Somdej Toh's amulets are renown for their power to protect, improve ones life and to bring about peace and happiness. Somdej Toh grew up at Wat Indraviharn and commissioned the large Buddha Statue visible at Wat KateChaiyo which is located just next door to Wat Indraviharn divided by a narrow lane running in between both temples, essentially to the visitor it's the same temple. Monks move between these temples as if they are one. Above are the photos some photos captured at the temple grounds. 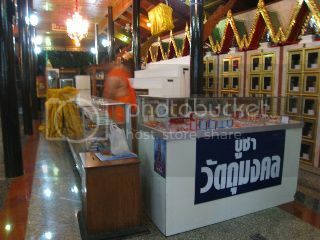 The first showing the Amulet Store for Wat KetChaiYo and Wat Inn. 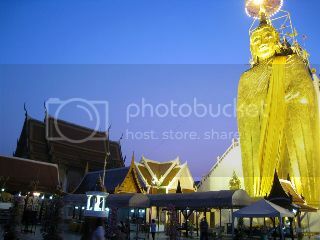 The next photo shows us the Buddha statue commissioned by Somdej Toh at the compound of Wat KetaChaiYo.